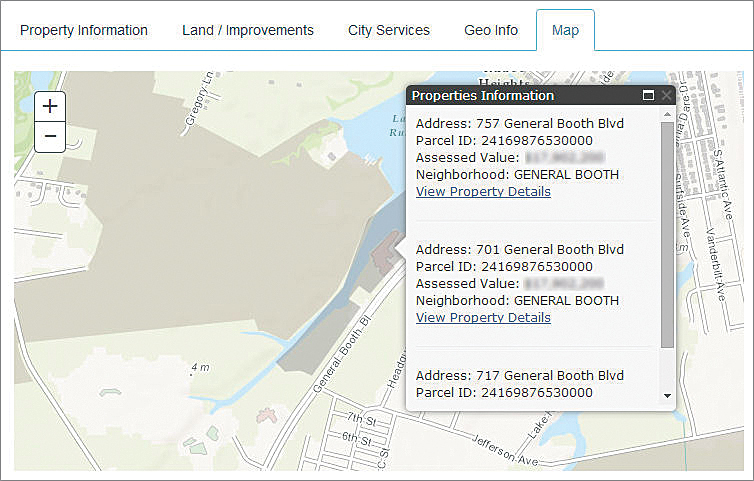 Virginia Beach's new Real Estate Assessment Search app uses ArcGIS Online basemaps and map services published using ArcGIS for Server. 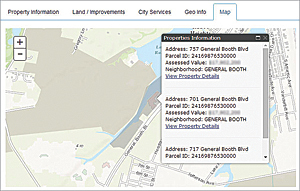 The City of Virginia Beach, Virginia, a longtime user of Esri technology, wanted to replace its existing real property information web application with one with enhanced search capabilities and would be accessible from mobile devices. The city used private Esri instructor-led training events to build expertise and teamwork within its organization. Virginia Beach is home to thriving businesses, major US defense installations, and approximately 440,000 residents. The Virginia Beach Department of Communications and Information Technology (ComIT) houses the Center for Geo-Spatial Information Services (CGIS). CGIS maintains the city's geographic data and creates maps and applications to support city operations. An Esri customer since 1992, Virginia Beach has contributed content to the Esri Community Maps Program and currently has 150 ArcGIS users in more than 20 city departments. In 2014, CGIS decided to replace an existing web application that provided access to property information from the Real Estate Assessor's Office. The application allowed users to search and view parcel-level property data, including assessment values over time. A mix of ArcIMS and open-source map layers was being used. ComIT is committed to providing its constituents with simple and open access to city services and information. The objectives for the new self-service property information application were improved search capabilities and mobile accessibility. "We're moving away from one big, centralized app with hundreds of layers toward smaller, more focused apps," said GIS coordinator Robert Jessen. To prepare their staff to create the new applications, Jessen and systems analyst Sridhar Katragadda arranged for two private Esri instructor-led training events. The CGIS staff who were working on the new property information applications are spread over four teams. They include GIS professionals and desktop, web, and mobile application developers. They had different training needs. Most of the developers were not familiar with the city's geospatial datasets or how they could be leveraged in applications. The GIS staff would benefit from learning how to create map services optimized for the new applications. Three staff members from each team participated in nine days of instructor-led training, which included two days of instructor coaching. Ben Ramseth, Esri instructor and developer technical lead for Esri Training Services, facilitated all training. Historically, interaction among the four CGIS teams had been limited. Each team had only a cursory understanding of what the other teams worked on. For Jessen and Katragadda, it was important for all 12 staff members to participate in the entire training together, even though all the content did not directly relate to each person's work. Jessen and Katragadda saw the training as an opportunity for participants to connect personally and professionally and build a foundation for future collaboration. "We wanted to get everyone communicating and on the same page," said Jessen. A challenge for Ramseth was keeping everyone engaged throughout the nine days. With the variety of technical skill sets and workplace responsibilities in the room, it would have been natural for participants to tune out portions of the training that didn't apply to their specific role. Fortunately Ramseth and the class members had time to build relationships. Several weeks elapsed between the two sessions, which turned out to be a key ingredient in the success of this training. During the gap, the web developers worked on their application, honed their new coding skills, and encountered issues they hadn't expected. In the second training session, they brought those issues up. With Ramseth's guidance, the group considered potential causes of these problems and potential solutions. The discussion was relevant to all participants, because all applications feature the same content and capabilities. Ramseth encountered his own unexpected challenges during the mobile development week. By design, instructor-led bootcamps are flexible and intensely hands-on. Participants are encouraged to direct activities. The Virginia Beach mobile developers worked in project mode during this part of the training. Their goal was to write the actual code for the new applications. When the iOS developers wanted to use Swift, Apple's new programming language for iOS and OS X, Ramseth was surprised. He hadn't completely familiarized himself with it, but he granted the request. Ramseth and the group dove into the inner workings of Swift syntax and code. The Android developers requested Android Studio as their integrated development environment (IDE), even though it was still in beta. Ramseth, who had planned to use the Eclipse IDE, once again was flexible and supported the request. When the teams broke into groups to work on their applications, they ran into an issue relating to rendering map services. Ramseth arranged conference calls with Esri software developers Divesh Goyal and Eric Bader, who answered questions and provided valuable insights into the ArcGIS Runtime SDKs. When it was over, Ramseth called the Virginia Beach training "the most challenging and rewarding thing I've done in a long time." With the successful completion of the Real Estate Assessment Search application in early 2015, CGIS is now developing a mobile application to support emergency response. Using a smartphone or tablet, city field crews and contractors will be able to provide damage assessments and report debris locations to the city's Emergency Operations Center (EOC). Citizens will be able to use the app to access information about road closures, city services, power outages, and more. "During power outages, people still have their devices and they charge them in their cars. It's important to have access to storm-related information and the ability to report damage available to citizens," said Jessen. The city's new web and mobile applications will provide fast access to geospatial content at any time from any device—desktop, smartphone, or tablet. For Jessen, the most beneficial outcome of the training was "developing the common understanding from separate lines of business into a single vision for GIS service deployment." There was another simple but gratifying outcome of the training: participants learned each other's names. Jessen and Katragadda are convinced the personal connections forged during the training events have paved the way for future cross-team collaboration. "Our teams are now ready to work together to create great apps in the future for the city," said Katragadda. For more information about the City of Virginia Beach applications, contact GIS coordinator Robert Jessen. For information about private Esri instructor-led classes and coaching, contact GIStraining@esri.com.